In 1459, after the death of Alfonso V king of Aragon, the Crown was entrusted to his son Ferdinand, also called Ferrante. Despite the support of the Pope, the Neapolitan barons did not recognize the authority of the new king and supported the candidacy of John, who belonged to the Anjou dynasty and went to war with the Aragons. During the initial period of the war, the Aragons were in trouble, because of the betrayal of several feudatories of the Kingdom, who took the side of the Angevin troops. The army of Aragon was surrounded near the area called “Foce di Sarno” and the king Ferdinand managed to escape. According to the historical tradition, the king had been saved by the voluntary and instinctive intervention of some inhabitants of Cava, led by five captains, who, on the night between the 6th and the 7th of July 1460, surprised the besieged Angevins allowing the king to escape to Naples. In August of the same year, Cava de’ Tirreni, once called Città de la Cava, despite being besieged by the Angevins, did not capitulate, but remained faithful to the king of Aragon and underwent the destruction of its harvests by the Angevins. On 4th September 1460 the king Ferrante, grateful for the loyalty and the courage demonstrated by the inhabitants of Cava, gave the Mayor Onofrio Scannapieco a blank parchment, on which the citizens could ask for any kind of request. The “Cavesi”, confirming their loyalty to the Crown, never asked for nothing. The king, astonished for their loyalty, conferred them the title of “Città Fedelissima”, several economic privileges, such as the exemption of the customs duty and the honour of adorning their own coat of arms with the colours of Aragon (yellow and red) and with the royal Crown. 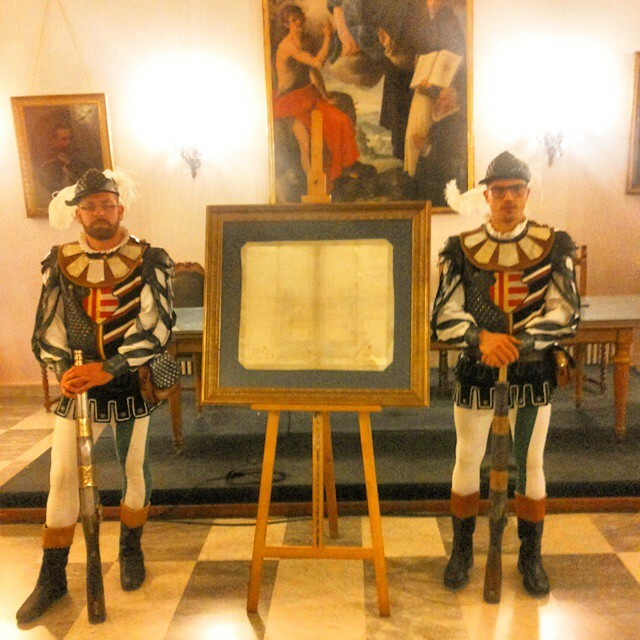 The parchment is still unblemished and it is preserved in the municipal files of Cava de’ Tirreni. In order to recall this event, the Groups of “Trombonieri” of Cava compete in a race of shots on the “Disfida dei Trombonieri”.